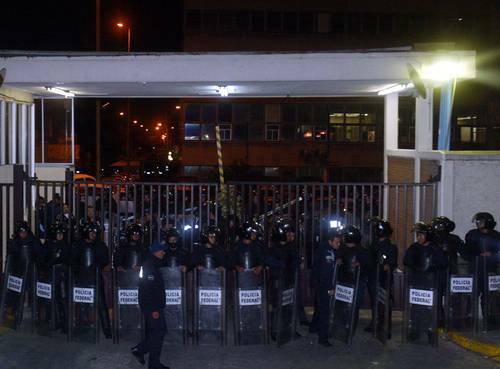 In the middle of the night last Saturday, President Felipe Calderon sent six thousand soldiers and militarized Federal Police to take over state power company Luz y Fuerza installations in Mexico City and the states of Mexico, Puebla, Morelos, and Hidalgo. Immediately following the takeover, Calderon issued an executive order closing Luz y Fuerza. Because no law or decree can go into effect until it is published in the federal government's Official Diary of the Federation, the government published the executive order in a special edition of the Official Diary of the Federation to coincide with the military and police raids that closed Luz y Fuerza. 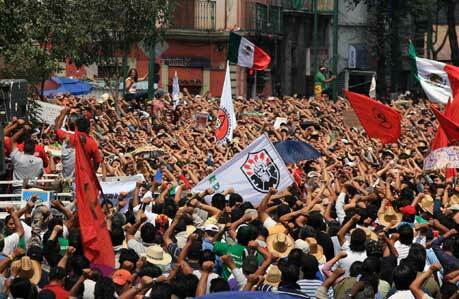 This current threat is the latest in a series of attacks on the union by the government of Felipe Calderón.The Felipe Calderón administration, having spent three years trying to destroy the Mexican Miners and Metal Workers Union (SNTMMRM), has now opened a new front in its war on the working class. In September the government launched a multifaceted attack intended to destroy the Mexican Electrical Workers Union (SME) which has been at the center of resistance to its neoliberal programs. In practice, these administrative procedures (which are nowhere found in Mexican labor law) are used against independent or democratic unions or against unions opposing government policies, and almost never against government backed, employer controlled or gangster-run unions. Without government approved and recognized officers, the union officials cannot engage in collective bargaining or other union activities, leaving the union officially leaderless. Calderón's administration has two motives in its attack on the SME. First, it wants to break the SME because it has been the center of so many movements resisting the Calderón government, its neoliberal policies, and particularly its plans to privatize the petroleum and electric power industries. Second, Calderón wants specifically to privatize the electrical industry, including the Central Light and Power Company, and to do so it must break the power of the SME. Mexico is becoming increasingly militarized under the pretext provided by the war on drugs. Mexican citizens are becoming correspondingly desensitized to such blatant displays of state military power in the civilian realm. Mexico's Constitution expressly prohibits the military's use in times of peace; however, this was not Mexicans' principle criticism of the operation against Luz y Fuerza. Mexicans consulted by this reporter complained that the operation was a blow to the country's democratic unions, as well as a step towards privatization of the energy sector. When this reporter commented on the barbarity of deploying the military and riot police against a civilian union--one that wasn't even on strike, as if that were to justify such represion--the response was, "Tienes razon. You're right. I hadn't even considered that." The use of the military and the Federal Police--who receive military training--against unions is fairly common in Mexico. The military and the Federal Police (formerly known as the Federal Preventive Police or PFP) have been deployed against striking miners and teachers. Likewise, in 2006 federal police violently put down social conflicts in Oaxaca and Atenco, both of which had their roots in labor disputes. "Mexico is becoming increasingly militarized under the pretext provided by the war on drugs. Mexican citizens are becoming correspondingly desensitized to such blatant displays of state military power in the civilian realm." Exactly. I am a native of Tijuana who wasliving in San Diego for the past few years, on my return in October I was shocked at the military presence in all aspects of daily life. It's strange when everyone takes for granted ski-masked federal police coupled with armed military patrolling city streets, digging bunkers alongside residential roads, stopping people indiscriminately. Sadly, the preemptive use of military force in a domestic labor dispute is a logical extension of Calderon's modus operandi.